Auto-Owners success can be traced back from its present management to the early leadership of Vern V. Moulton who, in 1916, organized Auto-Owners Insurance Company in Mt. Pleasant, Michigan. The infant Company had no capital and was housed in one room of a bank building. Auto-Owners operated in Mt. Pleasant for a little less than a year. In 1917, V.V. Moulton literally picked the Company up, placed it under his arm and in his pocket (the Company consisted of one book of policyholders' names and $174.25 in assets), and moved Auto-Owners to Lansing, Michigan. It wasn't long before the Depression began, and Auto-Owners weathered even the lowest point of that era - the bank holidays of February 1933. The Company demonstrated its corporate toughness and financial stability by paying all claims promptly, daily, and IN CASH! The firm was then writing more than $2.5 million in insurance premiums. Auto-Owners entered the general casualty insurance field in 1940, having previously written only automobile insurance. During the next five years, the Company found it necessary to acquire three more buildings in the vicinity of its main office to accommodate its continued growth. In 1951 it consolidated all of its offices into one home office, which was constructed in downtown Lansing. The Company wrote business in Michigan exclusively from 1916 until 1935, when it began writing insurance in Indiana and Ohio. In the '40s, Auto-Owners extended operations to include Illinois and Minnesota and, during the '50s, Iowa, North and South Dakota, Florida, Missouri, Alabama, Tennessee, and North and South Carolina. The Company began operations in Wisconsin in 1969, Georgia in 1973, Nebraska in 1978, Arizona in 1982, Virginia in 1989, Kentucky in 1994, Kansas in 1996, Utah in 1997, Colorado in 1999, Arkansas in 2005 Idaho in 2006, and Kansas in 2007. In November 2009 Auto-Owners began writing insurance in Pennsylvania, its 26th state. 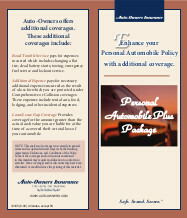 Today, Auto-Owners has underwriting, marketing and claims offices in Lansing, Michigan; Traverse City, Michigan; Montgomery, Alabama; Mesa, Arizona; Westminster, Colorado; Lakeland, Florida; Tallahassee, Florida; Duluth, Georgia; West Des Moines, Iowa; Marion, Indiana; Peoria, Illinois; Lexington, Kentucky; White Bear Lake, Minnesota; Columbia, Missouri; Charlotte, North Carolina; Fargo, North Dakota; Lima, Ohio; Pittsburgh, Pennsylvania; Columbia, South Carolina; Brentwood, Tennessee; Draper, Utah; Forest, Virginia; and Appleton, Wisconsin; plus over 50 claims branches companywide. The current Auto-Owners home office is located in a business and residential complex called Verndale, in Delta Township, west of Lansing. 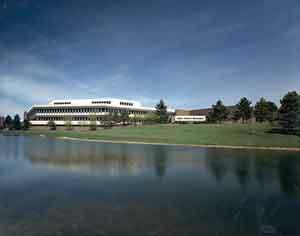 This building was constructed in 1975 and has been expanded three times, increasing its size to 404,616 square feet. The Lansing corporate office services not only Auto-Owners Insurance Company, but its subsidiary companies: Auto-Owners Life Insurance Company, Home-Owners Insurance Company, Owners Insurance Company, Property-Owners Insurance Company, and Southern-Owners Insurance Company. The Lansing branch underwriting and Lansing branch claims offices are also housed in the same complex. Auto-Owners success evolves from its loyal agents, policyholders and associates. The Companies are represented by more than 6,300 independent agencies, selling personal and commercial property/casualty and life, health and annuity insurance in 26 states. Total associates number more than 3,800. Auto-Owners property and casualty companies have the highest possible ratings from A.M. Best Company, A++ (Superior), and the Auto-Owners Life Insurance Company is rated A+ (Superior). The companies are also rated very highly in ratings assigned by other nationally recognized independent rating authorities.